Managing diseases, with benefits for people, wildlife and domestic stock. Many Ethiopian wolves have been killed by rabies and canine distemper. Livestock and people are also affected. We embrace a One Health vision working with many partners and sectors, and conducting cutting-edge research. We vaccinate thousands of dogs every year and we react to outbreaks among wolves by vaccinating the wolves themselves. In a global world, the risk of diseases to people and wildlife requires a holistic approach. Over the past month, EWCP vaccinated five wolf familes using oral rabies vaccines in the Bale Mountains (press release). This is a turning point in our plight to save Ethiopian wolves from extinction, following a decade of intensive research, field trials and awareness work. There are fewer than 500 Ethiopian wolves in the world, all in the wild and highly exposed to infectious diseases transmitted by domestic dogs. Working alongside the Ethiopian Wildlife Conservation Authority, regular oral vaccination campaigns will expand to all six extant populations to enhance their chance of survival. “30 years ago I witnessed an outbreak of rabies which killed the majority of the wolves I had followed closely for my doctoral studies. We have learnt much about these wolves and their Afroalpine homes since. By the time we detect rabies in a wolf population, already many animals are fatally infected and doomed. We now know that pre-emptive vaccination is necessary to save many wolves from a horrible death and to keep small and isolated populations outside the vortex of extinction. I whole-heartily celebrate the team’s achievement” (Prof Claudio Sillero, EWCP Director and Founder). “Vaccine contained within a meat bait were distributed at night time to three Ethiopian wolf packs. Our target is to immunize at least 40% of all wolves in each population, reaching as many family packs as possible, including the dominant pair – on which pack stability largely depends. We recorded good uptake, with 88% of 119 baits deployed consumed over two nights. Using camera traps we monitored bait consumption, and we will next measure rabies titres levels in blood, to confirm the effectiveness of the vaccine over a larger sample than that of the trials” (Muktar Abute, EWCP Vet Team Leader). Oral vaccination using SAG2 has been successful in controlling, and even eradicating, rabies in wild carnivore populations in Europe. This approach now raises hopes for the survival of one of the rarest and most specialized carnivore species. Preventive vaccination can improve the status of other threatened wildlife, and the Ethiopian wolf experience may lead to other practitioners to embrace it as part of their conservation tool kit, in a world demanding closer control of pathogens shared by wildlife, domestic animals and humans. Over the past three years we secured permissions to test an oral rabies vaccine in Ethiopian wolves. Following strict tests and protocols, we identified the wolves’ preferred bait and proved that the vaccine as safe and effective. Photos: Ethiopian wolf comsuming the oral vaccine and the team preparing the vaccine with goat meat, the preferred bait. An important scientific paper was published in the Vaccine journal reporting on the EWCP trials, including tests of bait preferences and delivery methods, in a few wolf packs in the Bale Mountains. This is the first trail of its kind. Never before the SAG2 rabies vaccine had been tested on wild populations of an endangered species, even though this same oral vaccine has helped to eradicate rabies in red foxes and raccoons over vast areas of USA and Europe. We are working with our partners on an integrated disease management plan that would reduce the prevalence of dog related diseases, bringing benefits to wildlife, people and their livestock. Oral vaccination could spare many from a hideous and certain death and deliver a concrete financial benefit. Oral vaccination is less stressful, cheaper and easier to scale up! Our fight again diseases is not over and we are not giving up. Over the past few years we worked hard to build a road map that will lead to more sustainable solution, with better engagement from all stakeholders, and we started by enticing the much needed political will. Thirteen years since Ethiopia wolves were for the first time vaccinated against rabies, four epizootics later, and after over 85,000 dog vaccinations, the extinction risk posed by viral diseases persists, fueled by fast growing human populations. Addressing the risk resulting from recurrent epizootics is a priority to protect the remaining wolf populations, with concomitant benefits for human health and livelihoods. Building on the various priority actions listed in the National Action Plan, EWCP drafted in December 2016 a document that delineates a holistic approach to manage diseases, involving various partners with relevant authority and competence, and put this document forward to promote further discussions and involvement (see BOX). The activities in the suggested plan are complementary and should be implemented jointly, as none of them in isolation will be sufficient to stop disease from infecting the wolves. A successful strategy will ultimately depend on maintaining high political support and the involvement of various partners with the required levels of expertise throughout. That is the challenge ahead. •	(as a last resort) emergency vaccination of wolves in response to a confirmed epizootic. Ethiopian Wildlife Conservation Authority, Ethiopian Wolf Conservation Programme, Bale Mountains National Park, Frankfurt Zoological Society, Bureau of Agriculture, Ministry of Agriculture and Research development, Oromia Forestry and Wildlife Enterprise, Amhara’s Environment, Forests & Wildlife Protection Authority, Simien Mountains, Arsi Mountains and Borena Sayint National Parks. •	alternatives for parenteral vaccination of wolves are gaining strength after successful trials of an oral rabies vaccine. •	in 2016 tests of a distemper vaccine in Ethiopian wolves proved this to be safe; more extensive trials are ongoing. •	vaccination of domestic dogs is in itself insufficient to stop outbreaks in wolves, because the required coverage level is virtually unattainable due to large numbers of dogs, quick turnover and their seasonal movements into the mountains. •	a collaborative effort in the Bale Mountains by Woredas, communities and EWCP moved forward policies to keep dogs near owners’ households in order to reduce dog-wolf contact; subsequently the National Park adopted the regulation, bringing hope of more efficient law enforcement within the Park. •	EWCP’s efforts to increase local capacity to detect outbreaks in dogs, swift laboratory testing, and rapid dissemination of news of outbreaks, are starting to bear fruits. 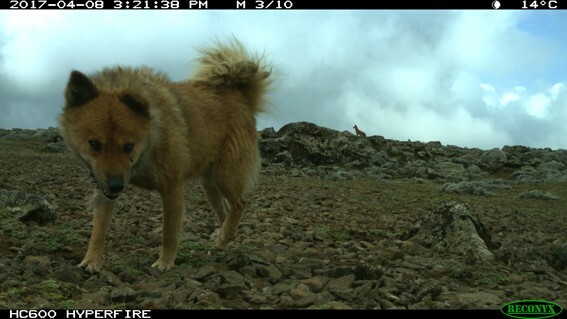 Photo: Our camera trap captured this domestic dog in close vicinity to an Ethiopian wolf in the Bale Mountains, during a study to learn how quickly, and what species, take meat baits that will be used to deliver oral rabies vaccines in the future. For over 20 years EWCP has been vaccinating domestic dogs in and around Bale Mountains National Park to reduce the risk of rabies spreading to the Ethiopian wolves (3,322 dogs were vaccinated between April 2016 and March 2017). If prevalence of the virus in the dog population is reduced, the chances of an outbreak will be also minimized. This One Health approach will benefit not only the wolves and other wild carnivores, but also dog owners and their livestock, for whom rabies is also fatal. Ethiopia has a higher rabies incidence than most African countries, most likely due to the high predominance of domestic animals as a source of zoonosis. We are increasingly interested in the wider impacts of our dog vaccination campaign, including in human health, and other cascading effects across Bale. One very useful source of information to investigate this issue are the reports from people bitten by infected dogs in their local Health Centres. Data from across six Kebeles (peasant associations) surrounding the Bale Mountains showed than in the villages reached by our dog vaccination campaigns there were no reports of human mortality to rabies and the reported numbers of livestock affected were negligible. Our vaccination campaigns, born out of desperation after witnessing wolves dying by the dozens over a few weeks in the early 1990s, has grown into a much larger and multi-pronged initiative, where the conservation benefits of vaccination take many forms. These include the local communities’ willingness to get involved in conservation, the popularity and acceptance of EWCP’s work in Bale, and the direct impacts on people’s health and livelihoods. The “One Health” approach promoted by organizations worldwide seeks to perceive the combined benefits of the fight against diseases and the need and importance of involving stakeholders and experts from different fields and government departments. This is the way forward for controlling diseases in the Bale landscape, and elsewhere, and one that we are passionately embracing. To achieve it, we need to work all together.